Research tells us that customers expect a response to their query in as much as about 60 minutes. And yet, most companies fail to appreciate how much customer satisfaction can really count. What should you do when you have a disgruntled customer at hand and do not have a response ready? If you’re running a business, you need to be ready for the times when things do not go according to plan – just like British Airways wasn’t there when a customer had a query about missing luggage. A response came around eight hours later, with their support team stating that they are only available 0900-1700 GMT. For a global airliner flying around the world daily, that’s not what people expect of a support team. Good customer service helps build in brand loyalty. Imagine if British Airways could have responded to the missing luggage query sooner. For one, the tweet wouldn’t have gone viral. If you thought this was bad, British Airways has still done better than Bank of America, which allegedly employs bots to respond to customer queries. Another airline that has not been as lucky as British Airways, was U.S. Airways, which failed primarily due to the lack of customer service. U.S. Airways had slashed its customer service budget significantly, resulting in numerous complaints and disgruntled customers. An interesting study states that as many as 67% of people have used social media channels to reach out to the customer support of a company. Businesses that have failed due to lack of customer service are many. W.T. Grant, a famous American retain institution failed because they could not adapt and reach out to their customers, even after 70 years of doing business. Yet, there are some companies who understand how important customer feedback really is. Since we have been talking about airlines, let us talk about one of the airliners that has taken customer service seriously. Jetblue has one of the best customer services you can expect. The company understands that good customer service doesn’t just start from redressing complaints, it involves going the extra mile to meet customer satisfaction and expectations. 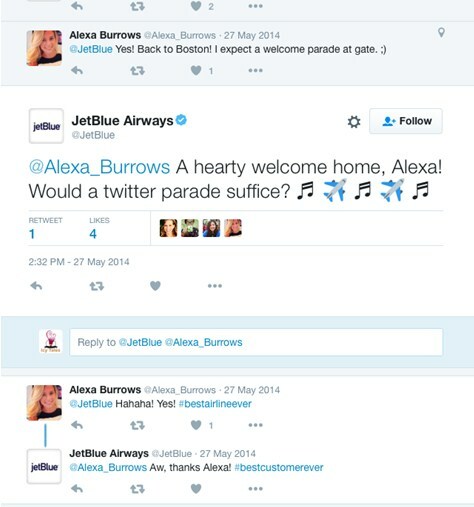 So, when a JetBlue customer tweeted to the company that it would be a great idea to have someone organize a parade for her jokingly, she didn’t think that anybody would take it seriously. Nobody did, except JetBlue. They organized a mini parade for her at the airport when she got down, much to her surprise. An incident like the one above increases customer loyalty and brand image, and helps customers identify themselves more with the brand helping in word of mouth publicity, increasing sales and driving in more revenue. JetBlue doesn’t just invest on having a dedicated in-house customer support team that dives in in-depth social listening, it ensures that social media channels are used wisely. You can send JetBlue emails and they won’t have a bot like Bank of America replying yours but one that is personal and connects exactly to the query you have. In fact, that’s where you would find Apple working as well. 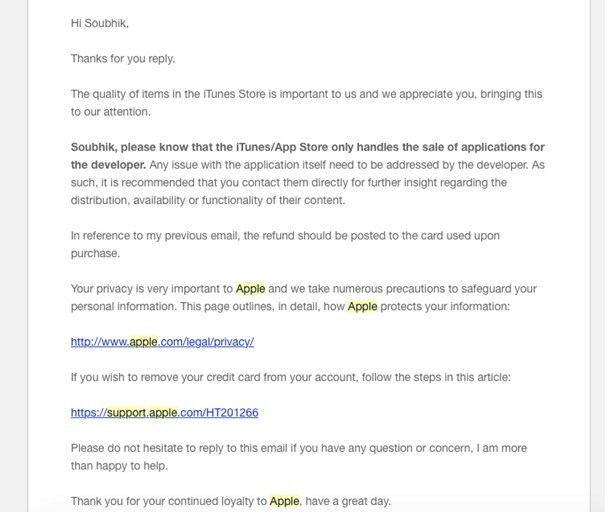 Here is a below snapshot of how Apple’s customer service responded to a fellow user. You would see that the answers are specific and can be made out that has been written specifically for the user instead of using a generic template and just inserting some words within it. Many rival companies still do not follow this method, and template pasted responses never inspire customer confidence. Apart from personalized calls and emails, companies can also use other forms of contact including SMS and WhatsApp. For customers who may not have access to internet or computer, the above two methods can work well. And you do not even have to reply individually. Slack, for one, uses an internal team tool that helps ensure a coordinated group effort in handling customer service issues. And while listening to customers can work wonders, doing things with a bit of humour always helps lighten up the mood. How does Handling Complaints and Grievances with Good Humour Help? What do you expect from the customer service of a company? One, that you would be able to reach them when needed. And two, that they would be able to solve your queries in the shortest time possible. There is a third aspect to this as well. And it involves as to how the customer team actually talks to you. 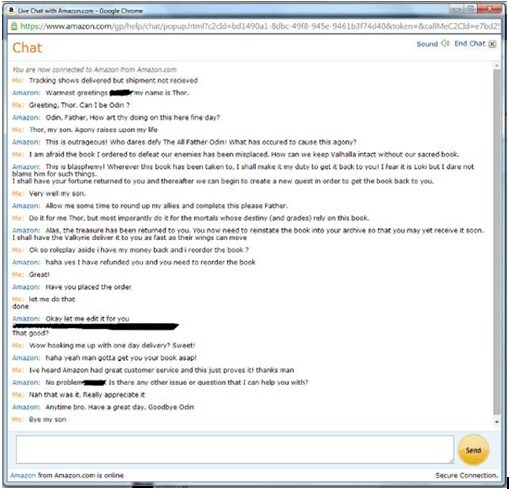 Here is an actual conversation that happened between an Amazon conversation representative and a customer. One look at it and you’d be able to tell that the man didn’t mind what went wrong – he would surely buy from Amazon again. 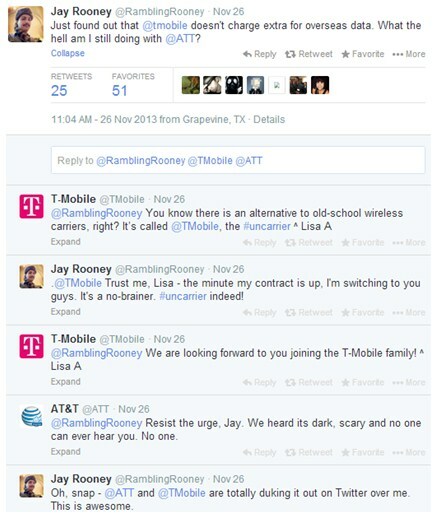 Good humour helps build customer trust. If you’ve a customer rep acting as if they’re working solely because they’re paid, it doesn’t give off an effect like one who loves to work where he is working. And that has an effect on the customer as well, as he judges the company environment from the customer reps he is interacting with. How to do it effectively? Good humour isn’t difficult. Do not go overboard when joking. But simple tweets like the one above by JetBlue in response to Alexa’s tweet can solve the purpose. It’s pretty easy, helps the customer feel connected to the company and gets the job done. Here is one instance of how JetBlue handled a customer complaint where John was worried about missing a flight due to JetBlue’s apparent handling of the issue. And here is one of the best ways you can use humour to ensure that your customer, well, stays with you and no one else. If you’re looking to effectively manage customer complaints and feedback, technology can help. Technology makes it simple for you to reach out to customers and for customers, to reach out to you. You wouldn’t have to worry about customer grievances being lost somewhere in between, and you would know. Social Listening is one of the best ways to know what people are telling about you and your company. For all we know, JetBlue doesn’t only rely on someone sending them a tweet directly @JetBlue to know if something is amiss, they can know about something going wrong through social listening as well. So, even if someone mentioned JetBlue right in their Facebook feed or in their blog, and talked about something that they liked or disliked about the company, JetBlue customer support staff would be able to know about it easily. They can then reply on time and ensure that if there is a complaint, it is solved out soon and if it’s an accolade, they do not forget to appreciate the user. And then there are feedback management systems that make taking feedbacks a lot simpler. For companies, one of the problems is to ensure that unadulterated customer feedback reaches them, and a feedback system like the one above ensures this easily. Customers can leave feedback as and when they want, whenever they need. And the data would reach the top management easily, so that everyone is kept in the loop. As all data can be analyzed through easy to use interfaces, brainstorming can be easier and focus areas simpler to tackle. April Fools’ Day 2016: The best pranks, jokes and reaction – and did you fall for our story? Zonka Feedback makes tablet feedback and surveys easy. It offers solutions for Customer Feedback Management and Surveys on iPad & Android Tablets. Intiutive Web Interface to build surveys, view statistics and take actions. Real-time Analytics, Alerts and Detailed Reporting. Designed for enterprises and small businesses alike. nextAre Instagram Changes Killing Small Business?